Here's my first admixture run using Reference 3 for Harappa participants. 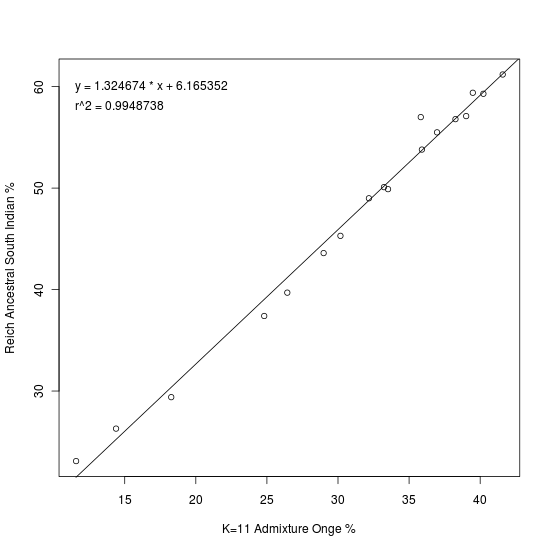 Since K=11 was the run with the Onge-ASI connection, I ran admixture at K=11 with all the 90 Harappa participants. You can see the participant results in a spreadsheet as well as their ethnic breakdowns and the reference population results. Here's our bar chart and table. Remember you can click on the legend or the table headers to sort. Using the comparison between the Onge component here and Reich et al's Ancestral South Indian one, I get the following linear regression. The correlation is 0.9949 which is probably as high as it can get. So let's calculate the ASI percentage for all the Harappa participants. Note that I didn't calculate the ASI percentage for those who had a really low Onge component since the linear regression above would not be valid outside the range we have in our original data. You can see the percentages in a spreadsheet too. Let's compare with the Dodecad ANI-ASI results. I have 22.5% ASI here while it was 20.6% in the Dodecad analysis. Overall, it seems like my technique results in about 2% more ASI than Dodecad's, with a few exceptions: Like Razib who jumps from 34.3% to 43.3% (averaging his parents who are very close). awesome! i think you got this right, visual inspection shows that the east asian fraction has finally restricted itself nicely to what you'd expect. btw, u correctly pegged my mother's (HRP23) mideast ancestry which is attested in oral history. it's a small fraction, but consistently shows up in my runs. I got 39.72% ASI here. That is pretty close to what I got in Dienekes' attempt at an ASI/ANI breakdown: 38.2% ASI. It is also pretty close to the other South Indian Brahmin ASI precentages that you have derived. It fits the general pattern that you observed: ASI is usually slightly lower in Dienekes' study than in yours. Clearly, the Onge component is the bulk of ASI, and the South Asian component is predominantly West Eurasian, but includes some ASI as well. This is different from the South Asian component that appeared in your runs that used Reference Set 1 - in those, the South Asian component at the higher Ks was usually slightly more ASI than ANI, at least in my view. Also, the Papuan component is absent in me, and is less common overall. The other interesting thing here is that my SW Asian and European seem higher than on the Reference Set 1 runs. This probably reflects the fact that the West Eurasian components haven't been broken up as much here. In particular, we don't get the fascinating "Baluch/Caucasian" component or anything that corresponds, but we do get an equally fascinating "Onge" component. Is C1 ancestral south asian? It seems to be present in all south asians without a sharp cline. In that case, C2 would be the ASI-Austric input from SEA, it peaks in SE India and is minimal beyond the Indus, almost the opposite of C4 SW Asian. That C5 Euro component seems about equal in northern south asia and Iran. ASI is minimal beyond the Indus, and C2 is (in my opinion) too well distributed to be from SEA. Most likely, C2 is a portion of ASI - it correlates well with ASI, but it doesn't cover all of ASI because the Onge are not actually ASI but "cousins" of the ASI. That leaves South Asian to cover the rest of ASI, though it also seems to be largely ANI. we don't get the fascinating "Baluch/Caucasian" component or anything that corresponds, but we do get an equally fascinating "Onge" component. if zack goes to more south-asian constrained sets in the future i think they'll show up again. that's where the lowest hanging fruit now is i think. I got 39.72% ASI here. That is pretty close to what I got in Dienekes' attempt at an ASI/ANI breakdown: 38.2% ASI. i think the closer u r to a classic ANI/ASI admix the better the estimate is. all the west eurasians are clustered really close. the problem with the austro-asiatics and bengalis is i think our east asian is close enough to ASI that there's confounding. zack got WAY better than dienekes cuz he has onge. but even here i think the onge is lower in indians than ASI and higher in south/east asians than ASI. Excellent exercise. This is the closest it can get to the ASI in terms of ADMIXTURE, if not spot on. Unfortunately I don't have the Dodecad ANI-ASI run to compare as I got my 23andMe results (and consequently participated in the genome blogging projects) only after Dienekes carried that out for the South Asian participants.